I find it extremely complicated to make any statement about what seems to be a better approach. My wish here is not to advocate for any particular model, but rather to make some observations on the legal settings that regulate these procedures. More specifically, I want to ask when and if the “child’s best interest” is considered independently in the process. The question of medical decision making with respect to infants, children and youth is usually worked out through child protection laws, applying standards meant to produce optimal outcomes with respect to the child’s physical and emotional wellbeing (e.g. “substituted judgment”, “reasonable outcomes”, etc.). But what triggers the application of these standards is an important piece of the puzzle. If we look at the different stakeholders in this situation, we generally identify the infant/child/adolescent, the parents/guardians, the medical staff, and the state. The child’s best interest question usually doesn’t come up formally, unless there’s a conflict between any of the stakeholders. Most likely, when it appears the medical staff disagrees with parents, in which case, the state can potentially use its Parens Patriae power to overrule harmful parental decisions (e.g. enforce lifesaving treatment, etc.). Another situation can accrue when the child is old enough to express refusal to treatment and asks the court to intervene (like the teenage girl who refused chemotherapy). In other words, the value of family privacy is overridden only when the state believes the child will be harmed, or when the child steps out on his own. 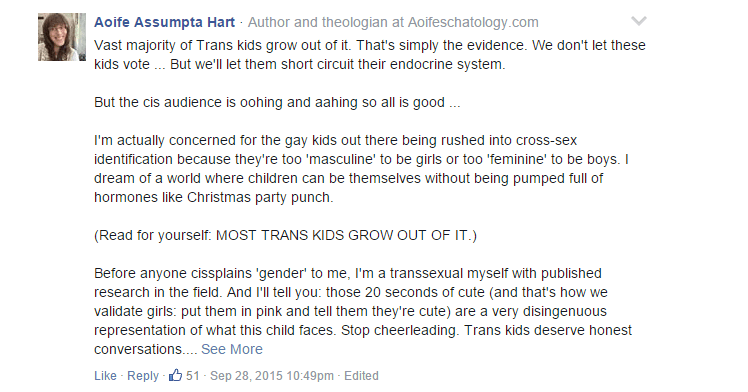 But this has not been the case for transsexual children so far. The popular story introduced by many usually doesn’t involve conflicting wishes between children and parents, nor between medical staff and the family. It’s actually presented as a protest of free will on behalf of children who wish to undergo medical alterations, asking their parents to help them get hormone prescriptions and medical expenses covered. In this course of business, one might ask, in what circumstances will the child’s best interest question arise? The current legal setting is working under the assumption that if family and medical staff don’t conflict, the child’s interests are being accounted for. This seems like a reasonable and intuitive assumption to make. But are we sure that if something is extremely desirable by both parents and children, then it’s definitely and without question in the child’s best interest? The case of transsexual children is very different from that of intersex children, and yet, we can still stress some useful parallels. It’s NOT the same because normalizing interventions made on intersex infants are usually done without their expressed consent, whereas Trans children often emphasize their desire to undergo such procedures out and loud, and even if not all, this discussion refers to those who DO. What IS similar in both intersex and Trans children, is that when doctors and parents agree, the decision remains within the realm of family privacy and the underlying assumption that it’s the optimal setting for medical decision making. The only ‘external’ intervention in the process in the current legal setting is that medical insurance companies have to decide whether to fund this or not, and work according to a different set of ethical motivations. Perhaps, a separate and independent consideration of the child’s best interest is done by the ethics consultants positioned in ‘gender clinics’ (like the one in Corey’s case). I am very happy for Corey and believe she is a very loved and lucky Trans teenager. My background on Intersex management on the other hand, has taught me that even a loving supportive family can often make bad decisions we should be aware of, especially if they’re irreversible and related to unknown territories like gender identification. The challenge in thinking how to better design decision making process when conflicts don’t arise naturally, is to keep in mind the dangers of paternalistic treatment towards families and patients. I have a few ideas on where to start, what do you think?